Because decisions relating to marriage and children tend to be highly emotional, complex, and life-changing, family law cases can be very difficult cases with which to deal. 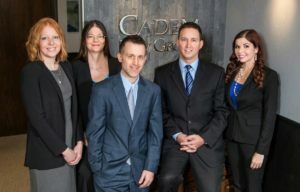 At Cadem Law Group, we know that each client’s needs are unique, and that each case involves distinct issues. Oftentimes, our clients are seeking little more than advice on their options and possible consequences. Other times, clients are faced with an angry ex-spouse or child custody matter that demands immediate and aggressive action. In either case, we are here to help. We are able to assist you in handling everything from divorce and child custody, to adoption, conservatorships, or guardianships. In no other type of case is our commitment to forging solid, long-term relationships with our clients more important. We take care to handle your case as if it were our own, and respect the sensitive nature of the issues you are facing. Contact our office online or call 218-739-HELP (4357) to schedule a free confidential consultation to discuss your options today. Key Practice Topics: Adoption; Divorce; Child Custody; Child Support; Spousal Maintenance; Alimony; Visitation Rights; Paternity; Domestic Violence; Divorce Decree; Order; Guardian Ad Litem; Social Services; Conservator; Spouse; Someplace Safe; Exchange; Interrogatories; Petition; Complaint; Taxes; Income Tax; Medical Coverage; Insurance; OFP; TRO; HRO; Marital Law; Safety Evaluation; Application; Petition.